The Cape May County Zoo is located in Southern New Jersey State, about 5 miles north of North Wildwood New Jersey. Getting to the zoo is really easy if you take Route 9 or the New Jersey Garden State Parkway which both lead directly to the Cape May Zoo. If you are planning a trip to Atlantic City, Ocean City, Stone Harbor, Wildwood or to Cape May New Jersey, I highly recommend that you visit the Cape May County Zoo as it is very affordable and makes for a great family fun day! Admission: FREE (they do ask for a donation, we usually donate $10.00 at the gate) and there is a lot of FREE parking. When you first enter the zoo you will encounter a variety of birds like guinea, peacocks, toucans and the barn owl. When walking through this area you do need to be careful as the guinea and chickens are free and will let you come right up to them. After you visit the bird area you will come to the barnyard animals area where you can feed the chickens, billy goats, pot belly pigs, etc. The billy goats will come up and eat the food right from your hand. Make sure you bring a few quarters so you can purchase the food at the exibit. After visiting that area you will come to the indoor bird building where you can go in and see all kinds of sea birds that are freely flying around! If you need to cool off during a hot day, go in the bird building to cool down. Just one warning, if you don't like birds that are freely flying around, then this building is not for you. After we came out of the bird building we found several exibits of primates! 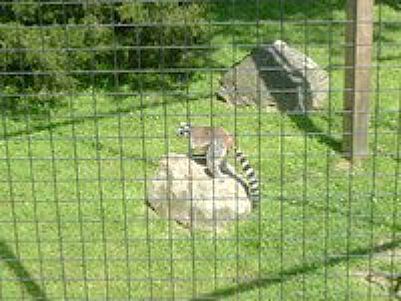 We saw redtailed lemurs, ringtailed lemurs and a variety of other monkeys that were there. I really enjoy watching primates and these primates are very active and will come up to you. However, never stick your fingers through the bars to touch them as they are wild animals and will bite you. Next we headed down the path to visit some of the big cats! We saw Rocky the Tiger, the male lion, the snow leopard twins, cheetahs and a few other big cats. Out of the big cats...the cheetahs are my favorite but my hubby prefers seeing Rocky the zoo's tiger! After visiting the big cats we went down another path and over a bridge to see the llamas, deer, alpacas, camels and ostrich. Wow, I never realized how big an ostrich really was until I saw the ones at the Cape May Zoo! Next we headed around the corner so that we could visit the giraffes and zebras. I love that they have a covered pavilion in this section where you can sit in the shade and watch them play, nap or rest...depending on the time of day you are visiting them. After we were done in that section we headed to the reptile building where you can see a variety of lizards and snakes. I will admit, I didn't go in there but hubby did. After he came out we saw the bears, large turtles and the alligator. There are over 500 animals at the Cape May County Zoo so there are many more than what I listed above. This zoo is extremely clean, well-maintained and just a beautiful place to visit. We highly recommend that you check it out if you are visiting the Southern Jersey Shore region. We try to visit the Cape May Zoo at least once every year and each year we are never disappointed. If you plan on visiting, I recommend spending a good 3 hours at the zoo so that you can take your time and enjoy each exhibit as you go along.